Several weeks ago I shared my new favorite way to watercolor outline images using Distress inks (although other mediums work great too) over on WPlus9 blog. In case you are not a subscriber of theirs, I’m sharing this video and project on my blog as well. 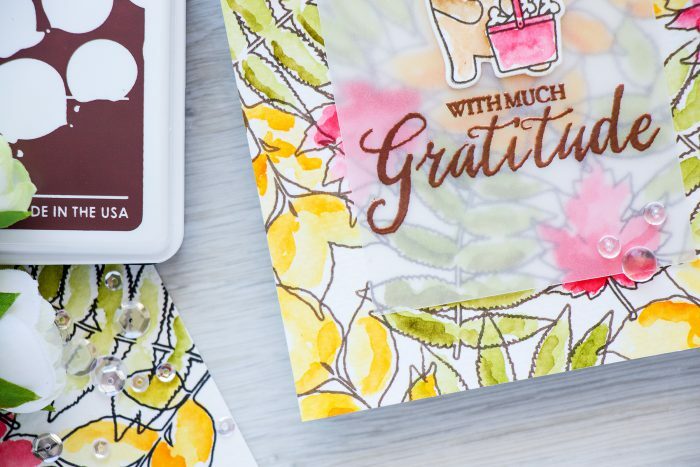 I love to watercolor and truth be told Distress inks are my current favorite watercolor medium – easy to use, lots of colors, cute little ink pads (and also storage tins, ha!). So I’ve been using them a lot in the past few weeks when I wanted to watercolor something. Instead of trying to stay inside the lines and make sure my watercolor is absolutely perfect I actually tried a different approach and started coloring intentionally leaving some areas white. I’ve created a video tutorial where I am sharing everything in detail. You can watch it below or on my Youtube channel. I started by stamping images, leaf outlines from the Autumn Leaves stamp set, in Coconut Husk Dye Ink. You can stamp them in black, but I had that particular color sitting on my desk and I wanted to give it a try. It is waterproof so works great with watercolors. I didn’t do any masking, I’m not a fan of masking lately (this is probably just a phase or something) so I just overlapped the images slightly when I did my stamping. You could do masking, but I think that would take a lot of extra time. Once my background was stamped I used several colors of Distress inks (all listed below) and a water brush to do my messy watercolor. I did two layers with the bottom one being lighter and the top one being a bit darker. Love the way it turned out. 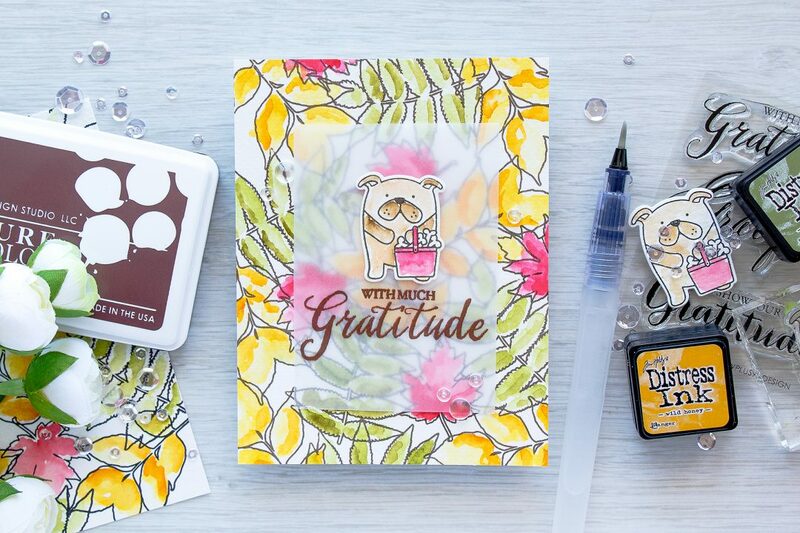 I needed a focal point for my card, so I stamped a little pup from Friends for All Seasons: Summer and colored him the same way. I would say that this loose watercolor does look better on leaves, not so great on the puppy, its okay, but not perfect. 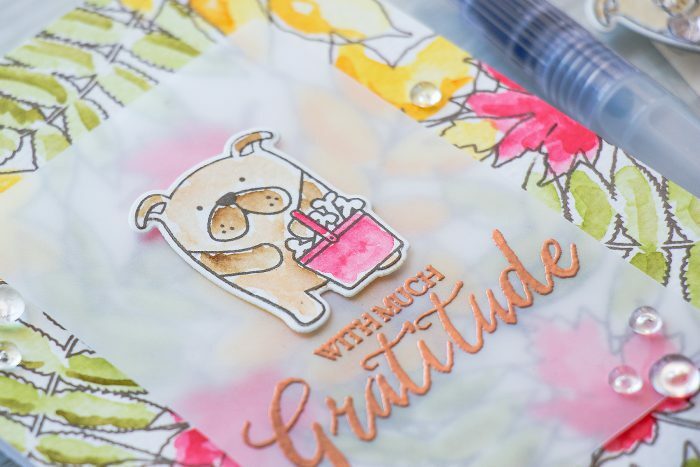 To create a sentiment I heat embossed “With Much Gratitude” in Hero Arts Copper embossing powder onto a piece of vellum; pup was adhered on top and that panel was foam mounted over the watercolor background. Great card, Yana. Love this “loose” water coloring technique. Can’t wait to give it a try. Very gorgeous card Yana ! Love your video with this very cool water coloring technique ! I have to try this ! Thanks so much for sharing. Love this type of watercoloring. Awesome result! Great water colouring., a very pretty card! So, so pretty. I always enjoy your videos and learn so much. I like how you showed the comparison between the card stamped in black vs. brown. The brown stamped card is so much softer. Thanks so much for sharing yourself with the world. I love this card because it’s so quirky! The beautiful traditional watercolor background makes a perfect base for the cute little doggy with his basket full of bones. I am thankful too, for your talent. Great water coloring technique. Love your card! Just got your email and noticed that you moved the the US and to Phoenix, AZ. Welcome, I hope you enjoy it here. Hot in the summer, but the rest of the year is lovely. 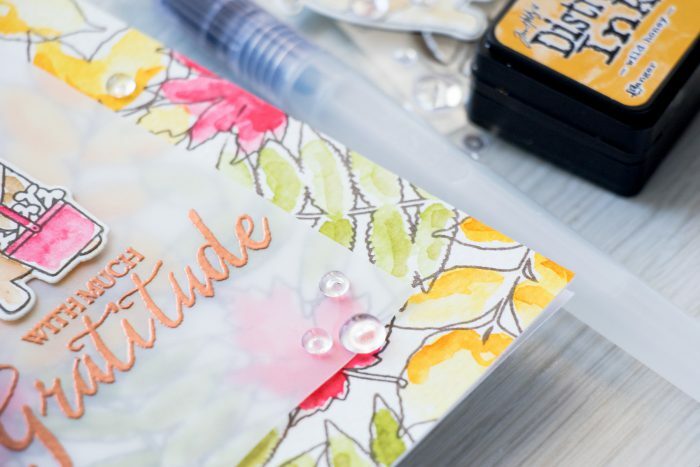 I have this stamp set and love to water color the leaves. Great idea to use it as a background. 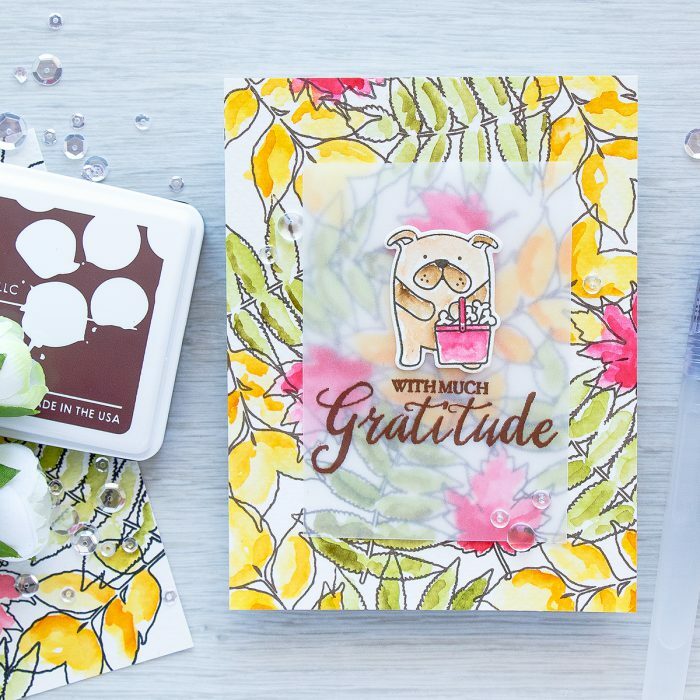 Brilliant video and water colouring technique – and what a beautiful card! Love this water colored look and no masking! Thanks for the video too! Love this technique! Very artsy look and easier to do! You always have such great techniques!